We’d like to thank everyone for attending our screenings, soirees, and seminars. Our weekly film series has come to a close. In 2017 we will be presenting select events: We will be continuing our seasonal seminars and cinema soirees featuring writers, directors, and curators. Our premiere event, Pop Music Explosion: Film Footage Fantasia on March 16, 2017, is a cinema soiree with Richie Unterberger, author and musicologist. Going forward, these newsletters will be sent out monthly to give you the latest on upcoming events. In presenting a new special events series, we are building on an important legacy. What began as an occasional screening from our stock footage archive grew into an award-winning weekly film series. Oddball Films showcased our rare and obscure films and featured international filmmakers and curators, with over 1,000 unique programs, all presented in their original format - 16mm film. We couldn’t be prouder! A huge thank you goes out to our chief programmer, Kat Shuchter. 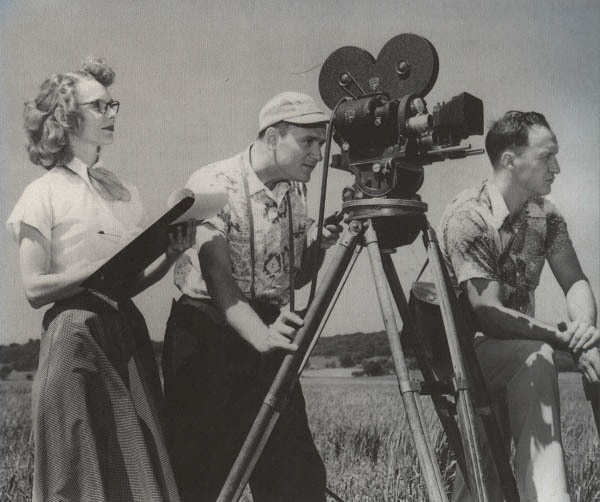 She presented truly one-of-a-kind programming at Oddball Films over many successful seasons. Her creative spark and deep digging in our archives invigorated our series with over 200 eclectic and inventive thematic screenings, like Stop Motion Explosion!, Learn Your Lesson, Avant Garde Rarities, and many, many more. Along the way we've worked with underground artists and directors like Paul H-O who appeared here at a soiree to discuss his controversial film Guest of Cindy Sherman. We provided famed filmmaker, Carroll Ballard with an original print of his 1975 abstract film Crystallization, and independent director. Nikolai Ursin also received an original print from us of his 1966 meditation on gender Behind Every Good Man for the UCLA Film & Television Archive’s restoration project. As we discovered forgotten or neglected prints for our screenings, we archived these films and programs into our database for future programmers, researchers, and scholars, and ultimately of course, for film audiences everywhere to enjoy them. We’ve enjoyed presenting weekly screenings as an important part of our stock footage business. We are still dedicated to entertaining our screenings audience and we will be presenting exciting events throughout 2017. If you’re a filmmaker and use stock footage in your projects, search our site or contact us directly. See how we provided important footage to producers like Martin Scorsese and TV programming like The Americans, and how Oddball Films is moving into 2017 as an exceptional resource for filmmakers everywhere. We’re providing the same type of inventive footage we’ve been known to present in our screenings! Watch this site and expect to hear from us in future newsletters. Have a happy and fun-filled 2017!